The seconds have been counted. The ball has dropped. The kissing is over. 2016 is officially in the HOUSE! The brains over at the Primary Peach are aware that sometimes we party a little hardy when the new year rolls in. It's often slightly difficult getting back into the swing of things once your two week break is done. So, they've made it easier for you to get a handle on your classroom before the grand testing season begins. Follow the Primary Peach this month as they provide you with TONS of ideas, tips, strategies, and suggestions for getting organized in the new year. I use two strategies in my room to help keep the chaos down to a minimum. I really want my students to react with each other, not just with their chosen cliques. I found this fun idea for using 'cell phone buddies' as a way to get them to talk with different people. Several times I need them to discuss what we are learning. I love telling them to 'Pull out your phone and call # ___." They jump all over it and love checking their list to see who they wrote down next to each number. It gets them excited even before they need to discuss things such as moon phases. If you click on the picture above it will take you to a pdf you can use for yourself. It is definitely NOT my idea though. I can't remember where I got it from. I do have to confess it is a bit of a struggle as we initially fill in our phones. I print out the phone buttons side and the number list side for each student. They choose a color of construction paper to glue each down on the inside. Then I tell them to go and find a partner for number one. They are to exchange phones and write down their own name on the correct slot and return the phone to its owner. We then switch to another person and write down a new name until our phone is full. I don't know what happens, but somewhere along the line they get mixed up and write their names on the wrong line. Sometimes, their partner is absent. To solve this I tell anyone who doesn't have a partner to join me in the "Parking Lot" and then pair up from there. 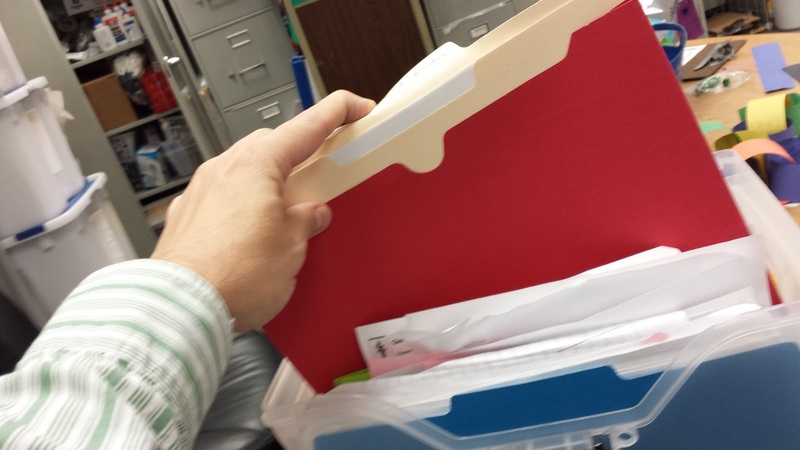 Another strategy I use is for Parent Conferencing is my File Box. I bought a file case with a handle and several hanging folders, one for each student. In these I keep portfolio information I want to use during conferences. I also keep samples of handwriting, clinic passes, absence notes, behavior cards, and any other note sent in from home. This way I can keep them all neat and tidy and pull out the one I need during the conference time. I do have a hard time keeping up with the filing of all this paperwork. 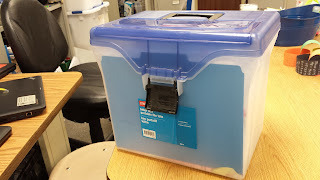 So what I do is stuff all these things in the front of the box and then the day before conferencing I have student helpers pass out all the papers. I give each of them their portfolio and walk them through how to organize the materials I'll need for the meeting. Yes, it's a little noisy but a quick way of getting it all done at once. Let's make 2016 a banner year together!